Setting up reviews in Charlie is easy. This guide will take you through how to create them on Charlie. 1. Who can do it? Company Leaders and Administrators can create review types for their team on Charlie. Avoid names that are specific to a time period eg ‘3rd Quarter Review’ or ‘Annual review 2017’. Instead choose a more generic ‘Quarterly review’ or ‘Annual review’ and set how often it will repeat. No tips here. Be as specific as you like. These are best for reviews happening across the company in the same time period - eg whole company Quarterly reviews. They can be used for reviews based on individual employee lifecycle. For example, probation reviews 3, 6, 9, 12 months after an employee started at the company. Reviews will be scheduled based around each team member start date. This is opposed to all team members having the same review at the same time of year. If you run a review periodically, you can set this to repeat on Charlie and say how often it should happen. This creates reviews for all team members that meet criteria you’ve set in the ‘Details’ and ‘Participants’ steps of creating a Review process. Reviews based on employee start date will only be created for team members who have start dates in the future. Reviews based on team member start date won’t be created for team members who don’t have start dates set for them. This allows you to be specific about who a review is for. Search or scroll down the list and select the appropriate people. This is best for reviews that are for individuals in specific teams or roles. 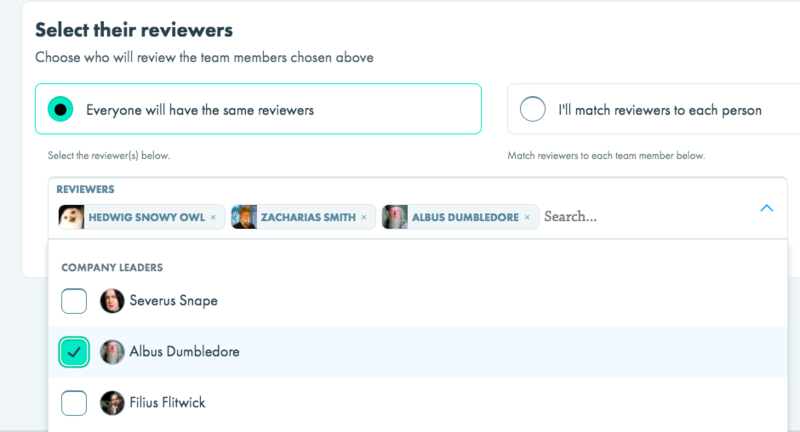 You can select more than one reviewer for each team member. Choose this option when everyone in the company is reviewed by the same person or people. For example, all employees being reviewed by the 2 Managing Directors. Choose this option when people are reviewed by their manager or heads of their team. This section allows you to guide participants on what to do before, during and after the review meeting. It will appear in every team member review belonging to this review process. These are questions you want team members to answer. These are questions you want the reviewer(s) to answer. This is the final stage and the place to check that you set everything up correctly. If anything is wrong, you can go back and make changes. Once confirmed, your review type is a set up and corresponding team member reviews will be created. The reviews will appear immediately if they are due to start in less than 30 days. If they're for a date further in the future, they'll be created 30 days before that. We remind your team up to a month before a review period is due to begin. Every Monday, reviewers are reminded of reviews they have coming up in the next month, 2 weeks and coming week. Team members are reminded of their upcoming reviews a month, a week and the day before they're set to start.